In Greens Glorious Greens! Johnna lbi and Catherine Walthers, both gourmet natural foods chefs, unlock the mysteries of buying and preparing these delicious vegetables. 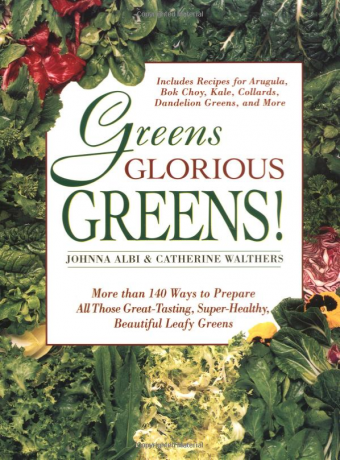 IN an easy-to-use A-to-Z format, they cover thirty-five different greens, providing nutritional information and a brief historical profile for each, plus tips on how to shop for freshness, and how to store, wash, and cut the greens for maximum flavor. Albi and Walthers offer more than 140 healthy ways to turn these nutritional superstars into delicious salads, soups, stews, entrees, and sautees. Most dishes are quick and easy, low in fat, and of the scale in terms of nutrients and taste. Many of vegetarian and therefore cholesterol free, some contain chicken, beef or fish. Any home cook will delight in this clear and engaging guide to preparing and cooking all the vegetables that are not only good for you, but just plain good. We know that there is life beyond broccoli and iceberg lettuce, but what is one to do with the odd-looking green things with exotic names that increasingly line the produce shelves? Albi and Walthers take a careful look at greens from arugula and dandelion to kale and mesclun and other salad greens. The authors explain their subjects’ virtues and shortcomings (steamed broccoli rabe served solo can be unpleasant); how to choose them; how and how long to keep them; how to clean them; and, in more than 140 recipes, how to cook them. Greens need a little help, they say, and many of the recipes lean on a smattering of olive oil, garlic or raisins to bring out the flavor: Kale with Raisins and Toasted Pine Nuts; Chinese Bok Choy, Shitake and Tofu; Garlic Escarole Soup with Rice. Carrots or red peppers can add color as well as flavor to a Broccoli Rabe Vegetable Pasta with yellow summer squash and freshly grated Parmesan or Romano is an exceptionally pretty and tasty dish. Interspersed are informational chapters on nutrition (most greens are high in vitamins, minerals and beta-carotene), the best cooking methods, and home gardening tips. “This is the greatest cookbook I have ever owned (and I have a lot of them)!! I have tried many recipes and they are all delicious. I never knew how to use collard greens before nor did I enjoy them until I tried some of these recipes. I can’t wait to try all of the recipes. I also learned how to use Swiss chard for the first time in my life. It’s been fun and delicious. I highly recommend this cookbook.